A day of high octane drama has seen the Champions crowned for 2018 at the Grand Finals of the SP Tools Australian Kart Championship, presented by Castrol EDGE in Melbourne. Aaron Cameron took the first KZ2 Championship for JC Kart after a dramatic weekend saw the Championship go down to the final race of the season. If reigning Champion, Joshua Fife was to win, Cameron had to finish 14th or better to secure his first Australian Kart Championship. Cameron got a great start from the second row, however Fife quickly got through to the lead. He established an advantage early and pulled away, while Cameron was embroiled in a battle for the minors with Troy Woolston and Christopher Hays. Late in the race, last round winner, Ricciardo Kart’s Dylan Drysdale joined the party and elevated himself into a podium position. Cameron played it cool throughout the race and brought the #95 JC home in fifth position, however was promoted to fourth when Woolston received a bodywork penalty post-race. This also brought Chris Hays forward to third placing after a tremendous weekend. Tasmania’s Lochie Dalton had amassed enough points throughout the weekend that he would enter the Grand Final 25 points clear – and having won two rounds this season, would take the Championship regardless, thus becoming the first Tasmanian to win a multi-round Australian Kart Championship. The battle for second would be intriguing with Broc Feeney and Joshua Denton locked on points. The race ebbed and flowed between the pair of them, with Denton opening a lead over Dalton before inexplicably going off track at turn one. The mistake opened the race for Dalton to take his third round win of the season – outgoing Champion, Scott Sorensen came through for second while Feeney wrapped up second in the Title race finishing third. KA3 Senior went to the wire once again, however Matthew McLean was able to come through to wrap up the Championship in fine style, taking the round win by 5.2 seconds. Tony Kart Australia pilot Jack Bell got himself through for a second placing and outgoing Australian Champion, James Sera came through for third position. Benito Montalbano confirmed third in the Championship with his fourth placed finish. Three drivers were separated by nine points entering the Grand Final for Cadet 12. A1 Engines’ Harry Arnett had six points over South Aussie EVO Kart driver Jimmy Pisczyk. What appeared to be a disaster for Arnett saw him shuffled from the front row down to eighth position on the opening corner, while Energy Kart driver, Marcos Flack was leading the way – who was nine points from the lead heading into the race. Arnett chipped away and moved himself forward and was then in the lead group. The top three in the Championship were soon literally line astern on the racetrack and it was anyone’s game – with the likes of Damon Woods and Cody Maynes-Rutty in the mix as well. Arnett led heading into the final lap with Flack closing down. It went to the final corner with Flack getting through on Arnett, however Arnett had enough advantage to secure the Australian Championship. Equally as dramatic was TaG 125. With Brendan Nelson leading by 17 points heading into the final race, the pressure was on Sydney-sider Cody Brewczynski. The Velocity Kart shop racer got to the front early and was under enormous pressure from local drivers Jordan Nicolaou, Jason Pringle and Troy Alger. Brewczynski maintained the lead – but there was drama behind. Nelson dropped back through the field with each lap that went by, the Queenslander showing concern with his Kaos Karting FA Kart. As they crossed the line, Brewczynski had amassed enough of an advantage to have claimed the Title – but the drama continued off track. Officials deemed that his nose cone had dropped down and then applied a two place penalty. This moved Nelson two points clear to claim his third consecutive Australian TaG 125 Australian Championship. Formula K driver, Jason Pringle was declared the race winner from TWM Kosmic driver, Barbara Anagnostiadis – her first AKC podium with Brewczynski claiming third. 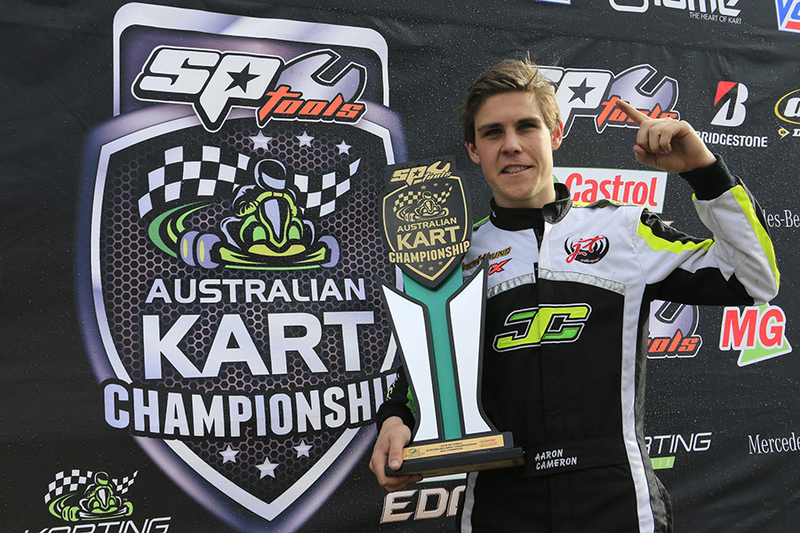 Rhys Smith hung tough to claim his maiden Australian Kart Championship in KA4 Junior. Despite a blitzkrieg from Kai Allen throughout the weekend that closed the Championship down heading into the final race, Smith showed the tenacity that has been the hallmark of his season to take a solid win. It was Scuderia PCR driver Smith’s fourth final win of the five rounds this this year and he beat home Allen. Fletcher Harris claimed third which gave him third in the Championship fight. For Allen, it wasn’t all despair. Despite not claiming the KA4 Title, he entered this afternoon’s KA2 Final as the Champion elect after this morning’s final heat, which he won convincingly. And it was a good job the Aloha Accommodation FA Kart driver had that luxury, as his Grand Final lasted no further than turn one. He was tangled up in a multi-kart accident when Blake Purdie was turned around, which also claimed AWC Motorsport Academy’s Jay Hanson who was aiming for a Series podium. This opened the race up for James Wharton who had the best of the start from the front row. He got to the lead and never looked like being headed. He came home with a 3.5 second win, however the battle for the minors was enthralling,. With his key opposition on the sideline, Jaiden Pope had to remain among the top group to claim second in the Championship. He had Kacey Mann around him, along with his fellow TWM pilot, Beau Pronesti. Pronesti delivered his best performance in the AKC to come through for a confidence building, hard fought second place, while Pope hung on for third. Harrison Hoey ended his maiden Senior season on a high taking the win in X30 and securing second for the Championship. He won narrowly after a race long battle with Champion elect Cody Gillis and local drivers Daniel Rochford and Jake Spencer. All drivers had time in the lead before Hoey did enough in the end to win narrowly over Gillis. Gillis, though was handed a post-race 10 second penalty to drop him to 22nd position. Spencer grabbed second with Rochford third. Gillis had already wrapped up the title on Saturday. In Cadet 9, Peter Bouzinelos made up for the disappointment of Lewis Francis being declared Champion on Saturday by taking a fine win. The Sera Driver Development driver beat home the new Champion in the Grand Final this afternoon after a strong battle between the top group. Jaxson Burns snuck through for third position in the end over Rock Han and Max Walton. Thus brings to an end the racing component of the 2018 SP Tools Australian Kart Championship. Sunday night’s presentation gala saw the Champions crowned, along with the MG Tyres Driver’s Driver, the Manufacturer’s Cup, the inaugural Ladies Trophy, the Teams Championship and Best Presented Team, along with a number of category presentations.